Soon, you might actually be able to say, "Warp factor 7, Mr. Sulu." Science fiction is famous for conceptualizing theoretical solutions to physical impossibilities. Authors and screenwriters come up with ideas that sound plausible, but scientists often have to step forward and say, "Hey, yeah, there's no way there'd be bright fire explosions in space," or "Lasers don't work like that, bro." One of the bigger physical impossibilities science fiction properties like Star Trek rely upon is faster-than-light travel. But now it seems even the so-called warp drive could perhaps become as much a reality as communicators (cell phones) and datapads (tablet computers). A presentation at the 100 Year Starship Symposium - a conference designed to discuss these issues - from NASA's Harold "Sonny" White outlined how such a warp engine could allow a ship to travel between the stars. "There is hope," said White. "The findings I presented today change it from impractical to plausible and worth further investigation." Mexican physicist Miguel Alcubierre first introduced a real design for a warp drive in 1994. The blueprint for Alcubierre's drive involved an oval spaceship surrounded by a large ring which would be able to contract the space in front of the ship and expand the space behind it. 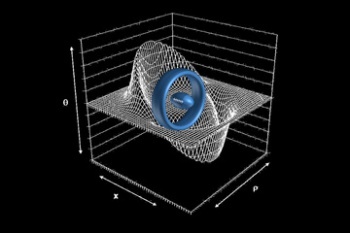 Creating this "warp field" would unfortunately take far more energy than the human race knows how to generate. What NASA's White came up with was a way to reduce the energy needs for the drive by changing the flat ring to a rounded shape as well as alternating the warp field. "The additional energy reduction realized by oscillating the bubble intensity is an interesting conjecture that we will enjoy looking at in the lab," White said. Of course, there's got to be some tests, you know, before we open up one of these rings and realize that we've created a portal to an alternate reality - complete with evil goatee-wearing versions of you and your friends. Luckily, White and his team is on the case. They've created a small model of the hardware needed to create this field which they've dubbed the White-Juday Warp Field Interferometer at their lab at the Johnson Space Center in Houston, TX. "We're trying to see if we can generate a very tiny instance of this in a tabletop experiment, to try to perturb space-time by one part in 10 million," he said. That's great. Now, I have to worry about the space-time continuum becoming "perturbed". That doesn't really sound like a very good idea, but, as the saying goes, if you want interstellar travel, you have to piss off a few warp fields.